I have never been very fond of Chinese desserts. Growing up, I would always prefer the ubiquitous orange wedges instead of red bean soup or sweet tapioca pudding at the end of a large Chinese dinner. My mild sweet tooth explains why I avoid treats like lotus seed paste filled mooncake which is traditionally eaten during yesterday's Mid-Autumn festival. 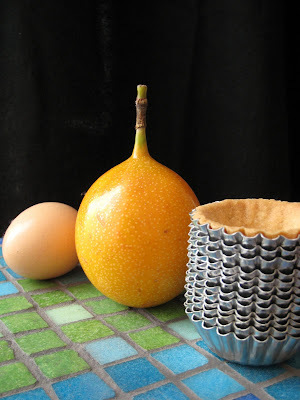 Instead, a new cookbook by Pichet Ong, The Sweet Spot: Asian-Inspired Desserts, was introduced to me recently and in lieu of mooncake, I decided to try the passionfruit dahn tart recipe. Dahn tarts (or "those darned tarts" according to Eric) are traditional egg custard tarts commonly found in any Chinese bakery or dim sum restaurant, typically made with a puff pastry shell. Using fresh passionfruit in a dahn tart is a modern twist which can add both flavour and texture due to the edible seeds. 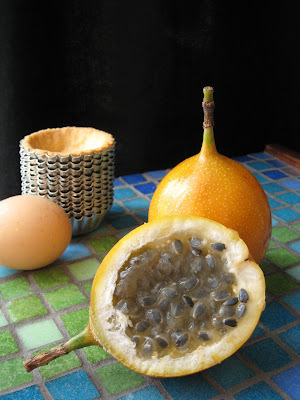 Having never seen or used fresh passionfruit before, the grayish mucinous pulp and insect-like seeds were somewhat repulsive to me initally; however, the floral aroma and pleasing crunch soon softened my negative reaction. I did modify the recipe by using leftover half & half instead of milk and leftover pâte sucrée instead of puff pastry due to frugality and laziness. 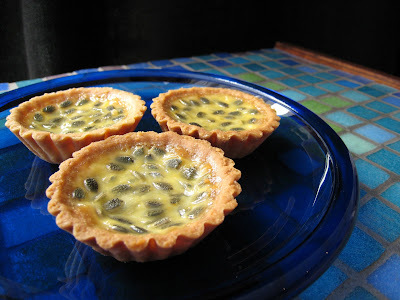 The soft custard centres were delicately flavoured with passionfruit and contrasted well with the buttery light tart shell. Perhaps next time, I would use less seeds because to me, a dahn tart needs its characteristic smooth glistening golden yellow surface. All I am missing now is the dim sum experience that precedes every good dahn tart. Posted by Charmaine at 11:04 a.m.